There’s a brand new horse movie coming out this summer and I can’t wait to see it! 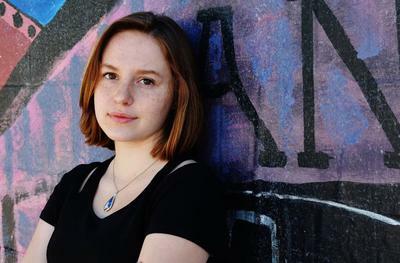 It’s called a Horse For Summer and it stars Mandalynn Carlson as Summer Dean, a troubled teen who ends up getting in more trouble. She does the right thing for the wrong reason, but the horse finds a tender spot in her heart and turns her around. This movie also stars Dean Cain, Christopher Atkins, Lee Meriwether and Nicole Criss. The movie is premiering in June in Los Angeles and as soon as I get info about when and where you can see it I will let you know! Mandalynn also stars in another movie coming out this December. It’s a Christmas movie about a girl and her dad who try to help save a horse farm. It's a great Christmas movie about horses. This movie stars Charisma Carpenter, Patrick Muldoon and Dominique Swain. The almost tragic ending to one of the movie's horses! Other than making movies with horses, I have only been able to ride on vacations and field trips and summer camps. One of my best riding experiences was in the Canadian Rockies. We had a real cowboy guide who led us through canyons and when we got to the end of the trail, I got to rope a calf and we ate a cowboy dinner, sang songs and then rode back. It was a beautiful ride. I've been lucky to have a lot of riding experiences in Kentucky, Tennessee, Colorado and Michigan where I am from. I like to ride Western because it fits my personality more. I am generally a laid back person and the horses I ride have the same personality as me. 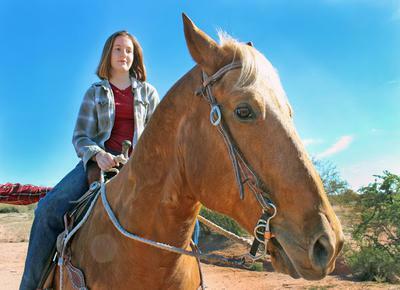 My horse in the movie A HORSE FOR SUMMER, which premiere in June 2014, was named Cowboy, who played Dakota in the movie. He is my favorite horse to ride. He is tan with white and gorgeous. He's a little full of himself, too, because he loves to be told how handsome or beautiful he is. He fishes for those complements and nudges you if he doesn't get them. Cowboy is a dream and a relaxed horse to ride. He is easy going and I didn't have to micro-manage him when riding. 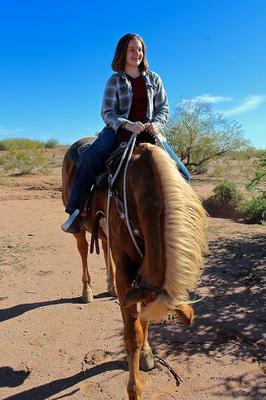 Cowboy and I had a great time riding on the ranch and in the Arizona desert. My horse in A CHRISTMAS PROMISE, coming out this December 2014, was named Epic Dream, nick-named Eppie. 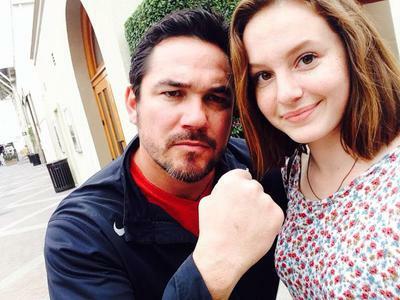 She played Holly in the movie. She is beautiful and young. I think she was three. The camera, while it loved her and she was amazing looking on film, the camera spooked her. She and I spent a lot of time together while I was on location in Texas filming. I do not have a horse of my own. I travel a lot making movies and do not want to neglect such a wonderful and loving animal by being gone so much. But when I have the opportunity, I love to ride. I have friends who own and ride horses here in Los Angeles. What's it like making a movie with horses? It can be challenging. Sometimes in a scene, the horse will look right into the camera. So then we have to start the scene over. Sometimes, the wind spooks them and they don't want to stand still anymore. Positioning the horse can be difficult because sometimes it takes a while to film a scene. Horses need to have lots of breaks, so after an hour, it has to have a break. Then we start the scene over, if we don't get it. I think it's cute, horses love sugar cubes. In A HORSE FOR SUMMER, director Nancy Criss decided to share with us that Spice, the horse that played Bella in the movie, was going to be put down. She was injured and this would be her last scene in the movie. She told us to make our words count because they were real. Nicole, who plays Sarah in the movie, and I ran off set for a few moments while they set up the shot. We cried together. We were devastated. We knew the horse had an injury and had been working with her for weeks and couldn't believe that she was so bad they had to make that tough choice. So in the scene, we were crushed. We were choked up. The scene was so emotional. When Nancy, the director, called CUT, she called us over to her. We thought this was it. She then shared that she was joking. It was a little director's trick to get the scene the way she envisioned it. We were overjoyed and a little miffed. Nicole and I were hugging Spice, because we were so scared during that scene for her. We were so happy it wasn't true. Spice, will live a long life on the ranch. I will be on the lookout for the official release and will let you all know so we can all watch it! Hi, I love this page. I am a huge fan and a backer. I believe more family friendly movies are needed. Being a mom to young boys that see way too much violence as it is, I am looking forward to helping spread the word about all the new and upcoming shows and movies. Nicole Criss got me also about the horse. I was able to meet Chalet Brannan in person recently and I know that this is going to be a movie for all time. Thanks for sharing this page with us. Hi Sydney, Thank you for interviewing me. I will be sure to let you know when A HORSE FOR SUMMER is out and how you and your readers can see it. I'll also let you know when you can see A CHRISTMAS PROMISE. I believe there are a lot of troubled teens out there. We wear masks and don't reveal our problems until its too late. When we reveal our problems to our parents, who say they can take it because they're adults and they'll understand, end up flipping out on you. That's all I have to say for now. when does it come out in Australia?